Q: First, on December 28, the US side expressed its disappointment over China allowing oil transfer to the DPRK, and said that there would never be a friendly solution to the Korean Peninsula issue if that continues to happen. What is your response? Second, an ROK foreign ministry official said today that the ROK side seized a Hong Kong-flagged vessel suspected of transferring refined petroleum products to a DPRK ship in international waters in late October, in defiance of the UN Security Council sanctions imposed on the DPRK. What is your response? A: Regarding your second question, I have no relevant information. I noted that there have been some reports about this, and I also took a similar question the day before yesterday. In response to the individual cases reported by the media, especially about a Chinese ship's alleged involvement in transferring oil to a DPRK ship in international waters on October 19, the Chinese side carried out investigations immediately. The fact is that since August, there have been no records of this ship docking, entering or leaving a China's port. Whether this ship has ever called at other countries' ports is not ours to tell. Therefore, what these reports claimed is not true. China has been comprehensively and strictly implementing the Security Council resolutions and fulfilling its due international obligations. No Chinese national or company is allowed to engage in activities in violation of the Security Council resolutions. If, through investigation, it is confirmed there are violations of the Security Council resolutions, the Chinese side will deal with them seriously in accordance with laws and regulations. Meanwhile, I want to draw all of your attention once again to the fact that the DPRK-related resolutions of the Security Council, including Resolution 2397, not only spell out sanctions measures, but also call for a peaceful, diplomatic and political solution to the issue and support for the resumption of Six-party Talks. We call on all relevant parties to comprehensively implement all these resolutions in entirety and make concerted efforts to maintain peace and stability of the Korean Peninsula and the region at large, advance the Peninsula denuclearization process, and promote a settlement of the issue through dialogue and negotiation. Q: The US said it felt disappointed at China allowing oil export to the DPRK. Do you have any further comments on that? A: I believe I have just now made myself quite clear. First, China has been comprehensively and strictly implementing the Security Council resolutions and condones no violations of these resolutions by any Chinese citizen and company. Second, any act of violation, once found and proven, will be dealt with seriously in accordance with laws and regulation. Not a single case of violation should get away with it. Third, regarding the specific cases recently reported by some media, like what I said to the Taiwan "Central News Agency", the Chinese side launched investigation immediately after learning the relevant reports. What is described in these reports turns out to be untrue. The hyped-up media reports are not conducive to building mutual trust and conducting cooperation between all parties on the Korean Peninsula nuclear issue. Fourth, all sides should comprehensively implement relevant resolutions in entirety, and make positive efforts to maintain peace and stability of the Korean Peninsula and the region at large, advance the Peninsula denuclearization process, and promote a settlement of the issue through dialogue and negotiation. Q: On December 28, ROK President Moon Jae-in said that the agreement between the ROK and Japan on the issue of comfort women reached in 2015 is seriously flawed and cannot solve the issue. But the Japanese side said that any attempt to amend the agreement will not be accepted. What is your comment? A: We noted relevant reports. On the issue of "comfort women", China's position is consistent and clear. We hope that Japan could heed the concerns of its Asian neighbors and the international community, and properly deal with the issue in a responsible attitude. Q: A delegation led by Toshihiro Nikai, Secretary General of Japan's Liberal Democratic Party (LDP) recently visited China. According to the Japanese media, Chinese coast guard vessels have been found patrolling the waters near the Diaoyu Island for two days in a row. What message is China trying to convey by this? A: I see no links between these two. As regards Chinese coast guard fleet patrolling in territorial waters off the Diaoyu Island, China's position is very clear. The Diaoyu Island and its affiliated islands have been China's inherent territory. It is China's inherent right to carry out regular patrols and law enforcement in waters off the Diaoyu Island. Q: It is reported that the "Islamic State" has claimed responsibility for a suicide bomb attack on December 28 on a cultural center and news agency in Afghanistan's capital, Kabul, that left at least 41 people dead and more than 80 injured. What is your comment? A: China strongly condemns this violent attack. We extend our condolence to the victims and sympathies to their families and the injured. China hopes that Afghanistan could realize peace and stability at an early date, and will firmly stand with the Afghan government and all Afghans in their fight against terrorism and pursuit of national stability and security. Before letting you go, I have one more thing for you: the regular press conference of the Foreign Ministry will be adjourned on January 1 (Monday), 2018 for the New Year's Day and resumed on January 2 (Tuesday). 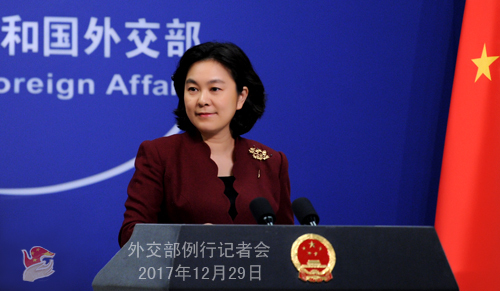 As we are wrapping up the last press conference of the year 2017, a year which has seen China's diplomacy reaping more ground-breaking achievements, I would like to express our heartfelt thanks to all of you, because none of that will happen without your dedicated work and support for us. We look forward to another year of close and pleasant cooperation with you. Here, on behalf of the Information Department of the Foreign Ministry and my colleagues, I wish you a very Happy New Year, Good Health and All the Best! Thank you! 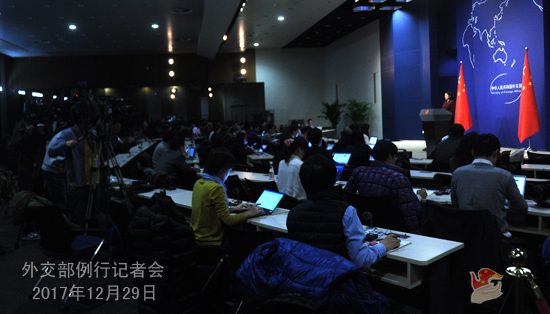 After the press conference, the following question was raised: a senior US official published an article on the New York Times, saying that the US will also continue to pursue American interests in areas, including trade, and China's rise as an economic and military power requires Washington and Beijing to consider carefully how to manage their relationship for the next 50 years. What is your comment? 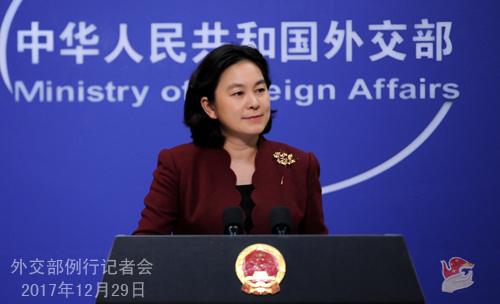 Spokesperson Hua Chunying said that our position on developing China-US relations is consistent and clear. China and the US share a wide range of common interests in spite of some differences. However, our common interests far outweigh our differences. China-US cooperation conforms to the fundamental interests of both countries and the world at large, and cooperation is the only right choice for us. When it comes to disagreements, we shall strive to resolve them in a constructive way on the basis of mutual respect so as to avoid disrupting the long-term development of bilateral relations. We hope that the US could work with China to focus on cooperation and manage differences on the basis of mutual respect so that bilateral relations can move forward in a sound and steady way.